With Instapaper and The Magazine, Marco Arment effectively invented the read-it-later and independent publishing idioms on iOS. Naturally, competitors followed but Arment was already a ‘front runner’ in the market. With Overcast, Arment is the follower. Overcast joins a whole host of other developers in a segment of the App Store that is already well established. It’s a different set of challenges. The app opens to the main list view, featuring playlists and podcasts, separated by unplayed and played. The navigation is powered by the four buttons in the top toolbar, which correspond to Settings, Downloads, Playlist and the Directory, for adding new podcasts. The line-width of the Settings icon is different to the other three, which is a minor niggle. More importantly, I don’t find the iconography here very intuitive. I couldn’t discern the meaning of the middle two buttons without tapping through. This makes the first launch experience slightly daunting, exacerbated by the fact that Arment chooses not to have any sort of ‘onboarding’ tutorial. Obviously, in some cases, first-launch tutorials are more of an annoyance than an aid, but I feel like it would have been useful here. You go from making a sync account, which is mandatory, to the screen you see above. That is quite a lot of ‘stuff’ to parse immediately. For example, greying out the toolbar buttons until a podcast is added would have better focused my attention. There is a good selection of import options, which contextually show based on what you have installed. Overcast can automatically offer import options for Downcast, Castro, Instacast, iCatcher and Pocket Casts. The actual process is a bit clunky, thanks to the siloed nature of iOS apps, but it is a million times more convenient than having to re-add all my podcast subscriptions manually. You can also import from any client that can export OPML, using iOS’ “Open In” feature (like from an email attachment). Unsurprisingly, picking a podcast on the home screen pushes a detail view, listing the episodes for that show. Arment augments the normal UIKit segmented control with a sorting arrow to switch between ascending and descending date order, which is a nice touch. Tapping on a episode makes it start playing and opens the Now Playing screen. On his podcast, Arment mentioned that Now Playing was a key focus for Overcast. At first glance, though, it is rather plain and ordinary. It features the standard large album art, with a scrubber above and the usual three transport controls below. It turns out the album art is actually scrollable. The album art scales down into a corner to reveal the show notes. The scrolling automatically snaps to the top of the show notes when you swipe. You can click through links with the inbuilt browser. I’m not quite sure why, but I found I used the show notes feature in Overcast much more than I have ever done in other podcast apps. In the current version, starring an episode signifies a recommendation, which only surface to your Twitter friends as suggested shows. In the future, I would like to be able to review what I have starred myself. Like most of Overcast, there isn’t anything especially flashy or outlandish about this interaction. It just works and makes sense. This plainness can also be seen in the favorite button. Starring changes the color of the shape from clear to orange (the app’s tint color) and that’s it. This flies in the face of current trends of the platform, where most apps are now defined by their use of spring-physics and bounciness. Although the animation is sparse, the style is internally consistent with the rest of the app so it doesn’t seem weird. The time scrubber looks good. I love the texture on the nub and the blockiness of the control meshes well with the rectangular toolbar it is attached to. I expected that you would be able to get some more fine-grained control with some sort of gesture, but that isn’t possible. Arment says that more advanced scrubbing is planned for a future version of the app. A slightly strange characteristic of the UI is that the scrubber nub never touches the edge of the screen; the actual track it can move along is inset by the duration labels. This is optically deceptive when a show is about to end, as although the bar is far from completely filled, the show has actually nearly finished. Overcast overlays a semi-transparent EQ just above the transport controls. Arguably one of the few exceptions to the statement I made above about Overcast’s understated interface, the visualiser provides some nice eye-candy in what would otherwise be a very static display. The clever part here is that the EQ percolates through the entire app, doubling up as a ‘now playing’ indicator in table cells on other screens. It’s a genius design. At the very bottom sit Playback and Effects. These buttons open modal sheets with a variety of customization settings. This is where you can toggle between continuous and one-by-one playback, set a sleep timer, or enable one of Overcast’s proprietary effects. 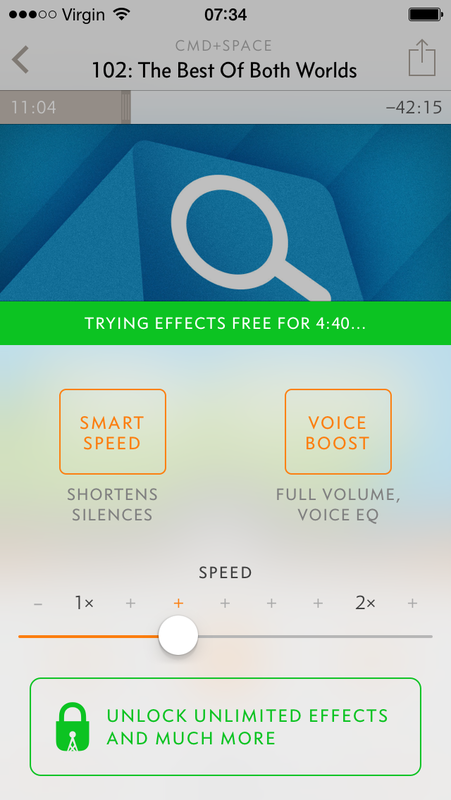 Voice Boost amplifies human speech and Smart Speed dynamically adjusts the playback rate to minimize silence in shows. Personally, I don’t like the outcome of Voice Boost but I find Smart Speed invaluable. The effect offers meaningful efficiency gains whilst maintaining the audio fidelity of what you care about: what the hosts and guests are saying. The time saved by eliminating silence adds up fast. Overcast even keeps a note of how much time you have saved by using the feature. I should note that traditional variable speed playback options are also available, but they feel positively archaic compared to Smart Speed. Overcast’s smart playlists offer a way of automatically organizing your library. My current set of subscriptions isn’t particularly large, so I’m not the target audience for custom playlists, but it seems capable enough, with a variety of filters and sorting options. A filter for starred episodes is not offered, however. Stepping back from specific features, I want to highlight one other thing that stood out to me. Normally, text and other user-facing elements of an app are written with a neutral, anonymous, tone. Overcast is composed very differently however, with Arment weaving his personality into much of the interface. For example, the FAQ is a “Skeptics FAQ”, when you add a show Overcast says there is “no pressure” to subscribe and Overcast “proudly” uses read-only OAuth tokens when connecting a Twitter account. Even beyond language, the Settings screen boldly links to some of Overcast’s competitors asking users to support indies. I can see why some people may be put off by this humanity, but I kind of like it. It makes you aware of the choices somebody made to craft the experience in front of you. In terms of pricing, Overcast runs on a freemium business model with a single In-App Purchase to unlock all features. On the store, Overcast will list as free, which obviously helps a lot with exposure. I think Overcast gives you a lot for free, especially given the fact that every user — free or paid — costs Arment in server bandwidth fees. For free, you can play episodes, subscribe to shows and make one playlist. Features like continuous playback, unlimited playlists, Smart Speed, Voice Boost and cellular downloads require purchase of the premium upgrade. The IAP costs $4.99, so Overcast is slightly more expensive than its competition, but this is compensated by the fact you can try out a lot of the app before paying. Effects can be trialled for five minutes without having to pay. The main limitation that users are likely to run into on free accounts is the restriction on cellular downloading, which obviously makes Overcast hard to use when travelling. Looping back round to how I opened this review, it is crucial to remember podcasts apps are really ecosystems in and of themselves. Overcast is entering an established category, where the incumbents already transcend iPhone, iPad, Mac, Android and more. This is the biggest wall Overcast faces as a 1.0 entrant: the cross-platform support isn’t there. The lack of a Mac client is particularly frustrating. Overcast.fm hosts a basic web interface for show playback, but it is lackluster. Arment has laid the groundwork for future native clients with Overcast Sync and has announced plans for an iPad version, but it isn’t there today. Overcast is fantastic for a first version of a product. There’s a finesse and elegance that is sustained throughout the application. What’s there is rock-solid and pretty damn great. The stuff that’s missing is what defines Overcast’s downsides. These are the costs of being late to the game. Arment isn’t stupid. He knows what needs to be done to catch up. Using Overcast for iPhone as an indicator of what is to come, I can’t wait for the suite of applications to be filled out. For now, recommending Instacast and Pocket Casts users to switch Overcast is hard for this reason. If you can deal with running just one instance of a podcast app (which is fine for mobile, it’s desktop sync that’s the issue), Overcast is a really great choice. In fact, even if you don’t want to switch just yet, you might as well try Overcast — it’s free after all. Overcast for iPhone is available on the App Store for free. All features can be unlocked with a $4.99 In-App Purchase.